M..E. DePalma Park is in the city of Wilton Manors, the 17th NWF Community Wildlife Habitat, in the United States. "The environmental conscience of Wilton Manors" is honored with a park named for her. Green spaces are so important to the city of Wilton Manors that it recently named a park after M.E. DePalma, described by vice mayor Justin Flippen as "the environmental conscience of Wilton Manors." You only have to look at her yard, probably the only patch of tropical jungle in Wilton Manors, to know that DePalma is a nature lover and gardener extraordinaire. She is a member of the Broward County NatureScape Board, is National Wildlife Federation Habitat Steward, and is active in the Moringa Garden Club. DePalma has been involved in Wilton Manors since she moved there in 1992, serving on the board of her neighborhood association, and as a member of the Planning and Zoning Board for two terms. She is also active in the Wilton Manors Historical Society and a member of the city's Community Emergency Response Team. But it was her drive in spearheading the effort to get Wilton Manors certified as an NWF Community Wildlife Habitat, the 17th in the United States, that prompted the city to turn a .14 acre plot of land, formerly known as Slash Pine Park, into M.E. DePalma Park. 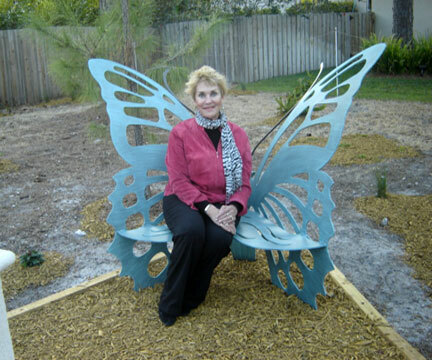 She is known around town as the Butterfly Lady for the many Naturescape Broward classes she has conducted on native plants and butterfly gardening, if not for the butterfly wings and antennae she often dons for such events. She continues to host educational environmental seminars at the Wilton Manors public library. The park, adorned by a butterfly shaped bench and a plaque on a pedestal with a butterfly atop, was designed with mostly native vegetation so that it not only appeals to birds and butterflies, but also uses very little water, and will require no sprinklers. "I don't want this to be all about M.E. DePalma, I want this park to be about the wildlife certification effort here," DePalma said, insisting that "no one works alone," on a project of this size. In typical DePalma fashion, she arranged the plaque so that she shares space with a picture of the state butterfly, the zebra longwing. "She's amazing, both her ability and her energy," said Gary Resnick, mayor of Wilton Manors, who likes to point out that Wilton Manors got its NWF certification with all volunteer effort, and no paid staffer working on the project. Although it was cold enough to make some South Florida natives, both plants and humans, shiver on Feb. 17 when the city held a dedication ceremony at dusk, there was an impressive turnout not only of city officials, but members of the South Florida "green community," all happy to see a show of support for the kind of work that often goes unsung in a community. "M.E. DePalma has made a genuine difference for people, plants and animals in her community," said Diana Guidry, NatureScape Broward Outreach Coordinator. "It is heartwarming to see this grand gesture and such a public show of appreciation from the city of Wilton Manors." Christine Winter Juneau is a National Wildlife Federation Habitat Steward. You can reach her at plntlady63@aol.com.